There are few things more satisfying than bringing about change in industries ripe for disruption. It’s something I’ve dedicated myself to throughout much of my career, beginning with the for-profit education space and continuing through both small business finance and, of course, banking. However, I’ve learned that the seeds of disruption need more than just intent to germinate. They also need a natural opening in the market that can be exploited. When I was a member of the executive strategy team at Apollo Group, the parent company of The University of Phoenix, my colleagues and I had the desire to reinvent the space and create a sustainable model for the industry. However, we lacked the opening in the market, as our ideas were about two years too early. The change we sought came only after market forces had evolved to such a point that change became possible. My greatest fear over the past year was that history was, to some extent, repeating itself. My desire to disrupt franchising needed the right window of opportunity which had yet to present itself. That all began to change about six months ago, as the first indicators of the sea change I’d been waiting for began to present themselves. At long last, for the franchise industry, the times are a-changin'. Before we dive into where the industry is going, it’s important to understand the dynamics that are a result of where it has been. The modern world of franchising was shaped mainly by the financial crisis of 2008, which, paradoxically led to a boom in franchising the likes of which was never before seen in the industry. Franchising and unemployment are positively correlated. When unemployment rises, more people look to franchising as a means of “buying” a stable job. This is an attractive opportunity for many as it combines the safety net of the franchise model with the relative stability and independence of business ownership. The industry was well-positioned to take advantage of the financial crisis and subsequent unemployment due to the popularization of web-based lead generation services and the subsequent rise of franchise broker networks. In years past, it was the franchisor who typically worked to drum up interest in their brand, often advertising in magazines, attending franchise expos, or marketing directly to prospective franchisees. However, as online lead generation became more popular and consolidated under a few companies, this began to change. Industry professionals realized that the person who controlled the lead ultimately controlled the entire sales process. They began to corner the market on leads and started working as an intermediary, intercepting the prospect before they engaged with a brand directly and serving as a guide. This led to the franchise consulting industry as we know it today. Franchisors, of course, were more than happy to accept this turn of events, as it meant that they could reduce their marketing budget and shift more of the lead acquisition cost into franchise fees. For the past ten years, the entire industry has been shaped by this dynamic. Brokers received a steady influx of people looking to “buy a job” due to high unemployment, and franchisors experienced periods of tremendous growth as a result. All of this began to change as the American economy grew in strength and, most importantly, unemployment continued to decline. It’s important to remember that there is often a disconnect between raw economic data, the general public perception of it, and an industry’s ability to respond. That’s why we’re only beginning to see changes in the franchising industry, despite the steady decline in the unemployment over the past eight years. At any point between 2010 and 2018, the general population viewed the drop in unemployment with a healthy dose of skepticism and held their breath to see how it played out. 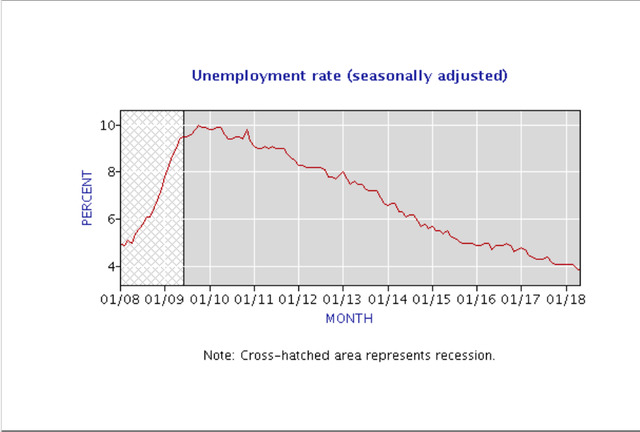 I believe it’s only been over the past six months or so that people have bought into the idea that unemployment is low and not poised to increase anytime soon. Perhaps this is due to years of conditioning and reinforcement, or maybe it’s due to the vocal cheerleading on behalf of the President. Regardless of the cause, there’s no denying the fact that people feel confident in their ability to get a job, and franchising is suffering as a result. We now live in a world where “leads” (people looking to buy a franchise) are in short supply. This reduction in leads is making the sales process dramatically more difficult for industry insiders, driving the change I’ve been seeking. The implications of this shift are massive, for every player involved. First of all, we’re going to see a significant reckoning in the franchise services sector. Many of the more cookie-cutter consultants and sales professionals who have been coasting on a favorable environment will be flushed out of the industry. With the brokerage industry operating in greatly reduced capacity, the franchise fee structure that evolved to support them will also shrink, making opportunities more affordable for buyers and lowering the economic hurdles to success. As growth slows, there will be a shift from quantity to quality. The candidates who engage in the sales process will be better qualified and better positioned for long-term success. Further, there will be a more stringent quality filter for franchise concepts. It’s often been said that growth covers up all weaknesses, and nowhere has that been more apparent than in franchising. Many brands that would otherwise struggle to survive on their fundamentals have been able to thrive because of robust early-stage sales growth. However, without the engine of easy sales propelling them, these brands will fall by the wayside. The strong brands with talented leadership, robust economics, and lasting concepts, however, will survive and emerge stronger as a result. Finally, franchise services companies like BodeTree will have to deliver on the promise of innovation and transparency. No longer will any service provider be able to coast on economic trends. My views are not popular amongst my peers in the industry, and my warnings have been widely dismissed. Now, however, as I see more and more confirming evidence pile up, I’m reminded of the lyrics to one of my favorite Bob Dylan song. “You'll be drenched to the bone. Times are changing, and I for one welcome the opportunity.